My 32GB Air is my first taste of what a cellular iPad is like, and I’m really enjoying the freedom that comes with being able to use the iPad anywhere. I actually have a 6GB smartphone plan that allows me to tether, but the Personal Hotspot on iOS just isn’t that convenient to use, so I decided to sign up for a month-to-month iPad data plan with Rogers (which offers the fastest LTE speeds in Toronto). Unfortunately, the way that Rogers’ tablet plans are tiered just doesn’t work for me. The lowest tier is $5/month so long as I stay under 10MB. With all of the various apps that can refresh in the background, that 10MB would be hard-pressed to last even a day on my iPad. Just surfing for a few minutes and checking email would kill it off. The next tier, $10/month for 100MB, is actually doable, so long as you’re careful to keep cellular data off until you actually need it, or you make sure to specify that only a select number of apps are allowed to use your cellular data. This $10/month is really where the flex plan should start, and I think it’s misleading to offer LTE customers anything less. However, even with casual usage, I managed to pass the 100MB mark within a week of picking up my iPad Air. Rogers’ third tier of their flex plan, which offers 500MB for $20/month, seemed like it could work for me. I used to have an iPhone plan with only 500MB/month and I got away without any overages. However, that was in the pre-iOS 7 era, when there were very few apps and services that were allowed to refresh in the background. I also received a lot less email back then. I’m nearly at the end of my first month with this Rogers flex plan and I’m hovering at around 450MB of data, despite spending 95% of my time on Wi-Fi. I’ve taken precautions to be careful about how much data I use remotely, but I’m still too close to that 500MB mark for comfort. I’m being careful because the fourth tier of the flex plan jumps to $40MB/month and provides up to 5GB. That’s more data than I could manage to use in a month, but it’s also double what I want to pay on a monthly basis. The sweet spot for me is a 1GB bucket of data for $20/month, and Telus offers a tiered flex plan that provides that, so I plan to switch over next month. I’ll likely be giving up the delicious Rogers LTE speeds, but paying any more than $20/month for a tablet data plan just doesn’t seem worth it to me at this point…especially not when I’m paying Koodo $60 for a 6GB smartphone plan as well. Until Koodo finds a way to support tablets on their plans, it looks like I’ll be a Telus customer for the foreseeable future. How does navigation work with an iPad and data? On a WiFi only iPad it is ghastly. With my iPhone I can get directions, “start”, and then sleep the phone — it only wakes when turns are coming up and it works fine even without a data plan so long as I stay on the prescribed route. How does the iPad work with cellular? I don’t use the iPad for car nav, but from a quick test in google maps, it seems to work just like an iPhone would. It’s also as accurate as my iPhone, since the cellular radio makes location services way more accurate. 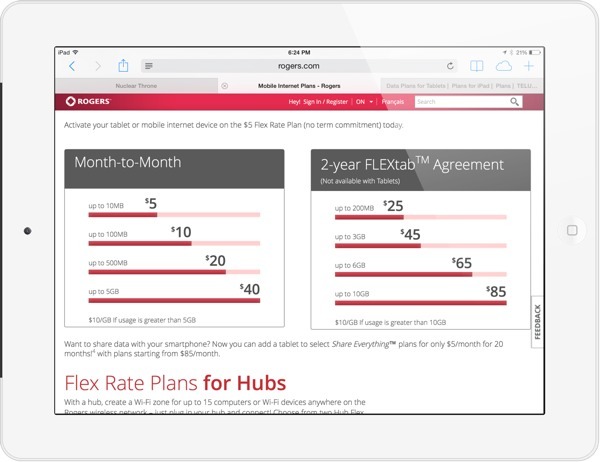 I use a rogers add on of $15/month which allows me to share my 6G bandwidth with my iPad. This costs me less than getting even a $20 plan from Telus. You probably nave a much better plan with Rogers than I could ever get. I found it tough to get anything decent with them for under $60. My $60 Koodo plan is the best deal I’ve ever had on a carrier.